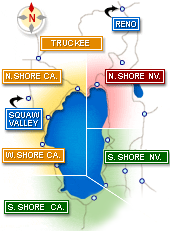 Browse the Top Lake Tahoe Fishing Guides and Tahoe Fishing Services by Region and Reviews. This South Lake Tahoe sport fishing company will provide all the necessary gear to get you on the water and hooked up. 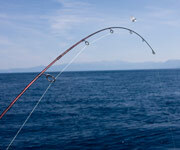 If you plan on fishing Lake Tahoe, check out these great Tahoe fishing charter & guide companies. 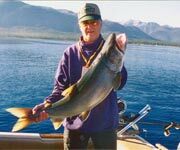 Booking a Lake Tahoe fishing charter or guide is a great way to spend quality time with your family and friends while reeling in a few Kokanee and Mackinaw. These Lake Tahoe fishing charter & fishing guide companies are affordable, fun and offer expert services. - Professional guided fishing services in South Lake Tahoe boasting the largest fleet in Tahoe... great location at the end of Ski Run Boulevard! Action Water Sports of Incline Village - Action Water Sports is situated at Incline Village and offer guided fishing charters in Lake Tahoe on their 28 foot Bertram Sportfish. They provide year round fishing services for Kokanee Salmon, Mackinaw, Rainbow and Brown Trout. Enjoy a full day of fishing with up to six people, and at the end of the day, take your fresh caught fish to the Lone Eagle Grill where the chef will happily prepare it for you. Sierra Fin Addicts - Head guide, Gerold Scholl, absolutely loves fishing, which makes for successful trips. His passion, knowledge and sheer fanaticism drive him to put you on the fish time and time again. You won't have to worry about anything. There is no experience required, and he will provide all the top-notch gear. Our Tahoe fishing guides boast over 2 decades of experience fishing the beautiful blue waters of Lake Tahoe! Finding guides for fly fishing Lake Tahoe doesn't have to be difficult. Check out these two highly recommended guides. There are multiple fly fishing services and fantastic guides in Lake Tahoe. You will find the high sierra rivers and tributaries can produce some of the best fly fishing in the States. Below are a couple of fishing companies that offer fly fishing services in the Tahoe area. Previous fly fishing experience is recommended, but not necessary, as they will teach you how to whip the fly. Truckee River Outfitters - The headquarters for Truckee River Outfitters is located in downtown Truckee; however, their knowledgeable guides will take you to more than just the Truckee River. Wherever the fish are biting, Truckee River Outfitters will take you ensuring that you are on the fish with the right fly to make the most of your day. Salmon Striper Fishing - Salmon Striper Fishing uses both conventional and fly fishing rods for their trips. It is your preference as to what type of fishing you want to do; however, I would definitely listen to the guides who have the scoop on what is biting where, so you can make the most of your trip. Check their website for more information and be sure to book well in advance as they can be busy during the hot seasons. Captain and guide Gene St. Denis has been fishing Lake Tahoe for the past 30 years. Planning a  Lake Tahoe fishing trip? Don't know who to call? Let us help you find the fishing experts and fishing charter companies that will make your next fishing trip in beautiful Lake Tahoe a successful and memorable experience. In this fishing guide you will find helpful resources on featured fishing charter companies, fishing regulations, where to obtain your fishing license, general descriptions of area fishing spots, and lists of who to contact for that memorable fishing charter. Fish Efficiently With Don Sheetz Fishing Charters! 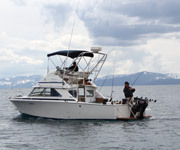 Reel Action is Lake Tahoe's premier charter fishing boat. "What a great resource I have found in your website. I recently moved to the Carson City area and have been wondering where to find info on Lake Tahoe Entertainment and Charter Fishing services. I found it all and MORE right here. Thanks." "We went on a fishing trip with Leonard O'Malley from Zephyr Cove just after the 4th, Wow, did we catch fish. I have to tell you that he really knows how to catch 'em. We caught 15 Mackinaw and Kokanee in combination. The soft mouthed Kokanee got off the hook 11 times but we boated enough to have a very nice dinner of Land Locked Sockeye Salmon. Thank you for this website, very informative..."
Tributaries to Lake Tahoe, July 1st through September 30th. No fishing is allowed within 300 feet of these tributaries.